The auto sales collapse that started in 2008 is hitting home in the service department in 2012. The number of vehicles in operation that are 5 years old and newer will dip to 63 million this year, forecast to be the low point of the industry's downturn and recovery, according to J.D. Power and Associates. Late-model vehicles traditionally represent the sweet spot for repair and maintenance work for dealership service departments. Fewer of them, combined with the continued decline in warranty work, mean a severe pinch in revenue opportunities for the service department. That has dealerships across the country looking for ways to bolster their nonwarranty, or customer-pay, service and parts business. Fending off the threat to a key dealership profit center is crucial. In 2011, the service and parts business represented 13 percent of overall sales for the typical dealership but contributed 72 percent of dealership operating profits, according to the National Automobile Dealers Association. 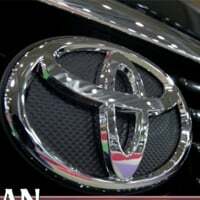 "At our dealerships, it is a serious challenge, and we've been preparing for it for two-and-a-half to three years," said Ron Stoner, vice president of fixed operations for Lithia Motors Inc. "At some point, if you're selling half the cars you did before, it's going to come around and affect our business." To compensate, dealerships are seeking work on older vehicles, trying to win back customers who have defected to independents and pumping up such lines of business as tires, dent-and-ding repair and quick-lube services. They're also trying to sell more maintenance and service contracts to keep customers coming back. Most are turning to technology. Some are experimenting with tablet computers. Many are mining their own customer lists and other databases to customize promotional offers. Many also are using their business-development centers and third-party software to track unsold work and try to get those customers back in the store. Asbury Automotive Group CEO Craig Monaghan sums up the efforts: "It's all about customer-pay." Results are promising. Despite the drop in units in operation and warranty, the public dealership groups are still reporting increases in overall service and parts revenues. "Our share of the service and parts business is so small that between price and convenience, you have the ability to still grow that business," AutoNation CEO Mike Jackson said. "We still grow that business despite the headwinds." Indeed, in the first quarter, AutoNation's same-store fixed-operations revenue jumped 4 percent, led by a 7 percent increase in customer-pay. Other public dealership groups reported jumps, too. Asbury's customer-pay business rose 8 percent. Sonic Automotive Group reported a 9 percent increase in customer-pay revenue. The customer-pay gains were the biggest in recent years, they reported. Overall service and parts sales rose across the industry. 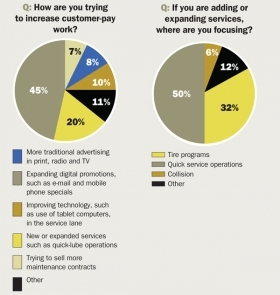 According to NADA, the average dealership's service and parts revenue increased nearly 6 percent in 2011. But the industry remains concerned about the combination of fewer units and declining warranty work, caused by improved vehicle quality. 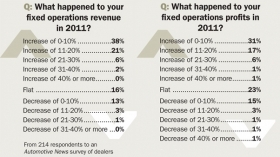 In an unscientific Automotive News survey about the service and parts business, about one-quarter of 214 respondents expect fixed-operations revenue to be flat or down in 2012. "It's a huge challenge to get your customer back into the service department," said Bill Underriner, a Montana dealer and NADA's 2012 chairman. He talks his service department up to every car buyer who comes through his dealership, and his Internet department follows up to schedule maintenance appointments. Underriner also plans to add iPads -- used by dealers to automate vehicle evaluation, speed service and better engage customers -- to his service department in the near future. All the public groups are experimenting with or making plans to use tablet computers in their service departments. Sonic has iPads in the service departments at more than a third of its dealerships; its rollout will be complete next April. Grosses per repair order are up at stores with the devices. David Padgett, Sonic's vice president of fixed operations, anticipates more upside. Techs who find additional problems are able to take pictures to send to customers. By offering a discount along with proof of a problem, Sonic is more likely to win customer approval of additional work, he said. If it doesn't, the dealership prints a hang tag to leave in a car with the summary of the recommended repair. Sonic's closing ratio on such unsold work had been rising even before the iPads, Padgett said. The company uses specialized software to track those opportunities closely. Padgett separates Sonic's customer-pay work into categories such as quick-service, tires and repair. If he sees one category lagging, he digs into the data to look for a fix. "We watch it like a hawk," Padgett said. Many dealership managers say they are cutting prices or offering promotions to stay in line with independent shops. Perception of higher prices has long been a reason consumers abandon dealerships. Sonic mystery-shops independent repair shops quarterly to make sure it stays competitive on price. Lithia has increased its tire business by pricing tires in line with the tire chains and then throwing in free road-hazard coverage on top, Stoner said. The tire chains typically charge extra for that. While tires aren't much of a moneymaker, the tire business helps tie customers to the dealership. Another Lithia initiative that has increased long-term loyalty rates and driven good word-of-mouth is its 3-year/50,000-mile warranty on any repair, Stoner said. That was launched in 2007, along with a mandatory inspection system. Techs evaluate every vehicle that enters the shop on a red-yellow-green system that flags problems needing attention. The strategy has helped drive Lithia's customer-pay business up 6 to 9 percent for the past three to four years, Stoner said. More older vehicles are coming in. Customers no longer automatically stop using the dealership for service when their cars hit the five-year mark, the big drop-off point historically, he said. It's important progress. Lithia needs customer-pay to increase 7 to 10 percent annually just to compensate for declines in the warranty business that have averaged 12 percent for the past three years, Stoner said. "This is our 100 percent focus," he said. Tying customers to the dealership for maintenance is a popular strategy. One respondent to the Automotive News survey is offering a lifetime powertrain warranty to buyers of used vehicles that follow the recommended maintenance schedule at the dealership. Such efforts have dealerships throughout the industry gaining ground against independents in the crucial customer-pay categories, said Chris Sutton, senior director at J.D. Power. Dealerships are putting more effort into the battery, brakes and tire categories -- areas where customers typically defect to independents. From 2010 to 2012, dealerships got a larger share of maintenance and repair visits and a bigger share of spending from owners of 3-year-old vehicles, according to a J.D. Power study. Manufacturers and retailers now pay more attention to when a vehicle is about to come out of warranty, Sutton said. And they're getting smarter about leveraging customer databases and using software tools to automate regular contact with vehicle owners. "They've done a better job of inspecting the vehicle and notifying the customer of what kind of work they can plan for on the vehicle," Sutton said. "Then they can market to the customer and follow up accordingly." That's helping Brian Benstock, general manager of Paragon Honda and Paragon Acura in New York. In the past year, Benstock has remade his service departments with an intense focus on customer retention, using software, his own database and a business-development center to bring in additional work. The resulting spike in revenue will offset the challenges facing the business, Benstock said. He said: "You don't need more units in operation if you're contacting all your customers."